Beat butter and sugar well. Add flour, salt, orange rind and juice. Beat the egg yolks with the milk and vanilla essence and add to the mixture. 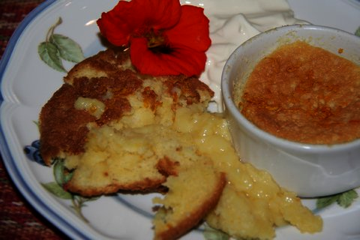 Pour into a well buttered corning-ware dish or small ramekins. Bake in bain-marie for 1 hr at 180 C for an hour or until set and golden brown. Serve with crème fraiche, cream or ice-cream and shreds of caramelised peel. TIP: Remember to blanch your orange rind, especially for delicate sauces and flavouring by placing it in a colander and pouring over some boiling water to remove the bitterness. Peel needs a more thorough process. Plunge it in boiling water and boil twice before coating in caramelised sugar etc. Always try and avoid as much pith as possible.